This is a very nice example of how to totally transform a large but previously poorly designed and finished bathroom in a quality home. In this example we created symmetry where before there was none. The Decadence twin end bath was installed in the center of the bath wall and the feature area used to place wine glasses for example when enjoying a bath was completed in silver shell mosaic tiles. Many Hamilton bathrooms (and those in similar areas) simply need the services of a qualified bathroom designer to enhance the property and add true value to the home. This large bathroom also required a raised floor area in order to assist the drainage from the newly added wet room floor and walk in concealed mixer shower. The ceiling height was 2.8m and so by finishing the tiling at 2.4m (same height as the main doorway) the remaining wall space was plastered and painted to provide a beautifully finished and proportionate look. Under floor heating was also installed using the latest intuitive colour screen controller. 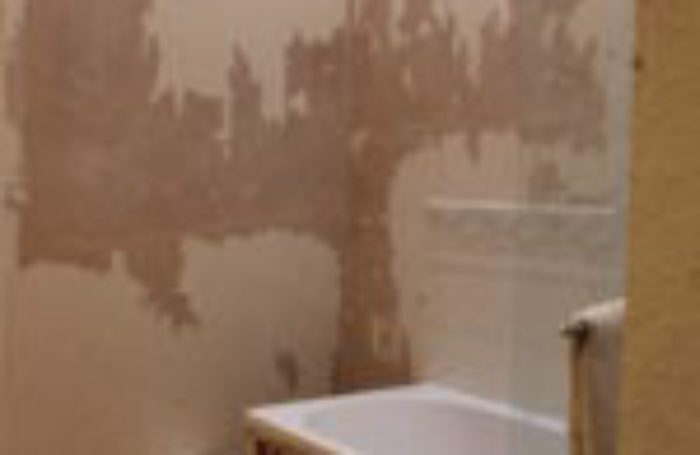 Dynamic Home provide high quality bathroom and kitchen installations throughout Glasgow, Hamilton and surrounding areas.